Some venues don’t allow liquor, which ends the debate quicker; and some of your parents may absolutely, definitely, want to have an open bar all. night. long. Splendid. But for the rest of you still twiddling your thumbs over whether or not to host just beer and wine or more than just beer and wine, let me introduce you to the signature cocktail. Signature cocktails keep the liquor contained to a few signature drinks. Ones that either you like, your fiance likes, a large group of friends or family like. 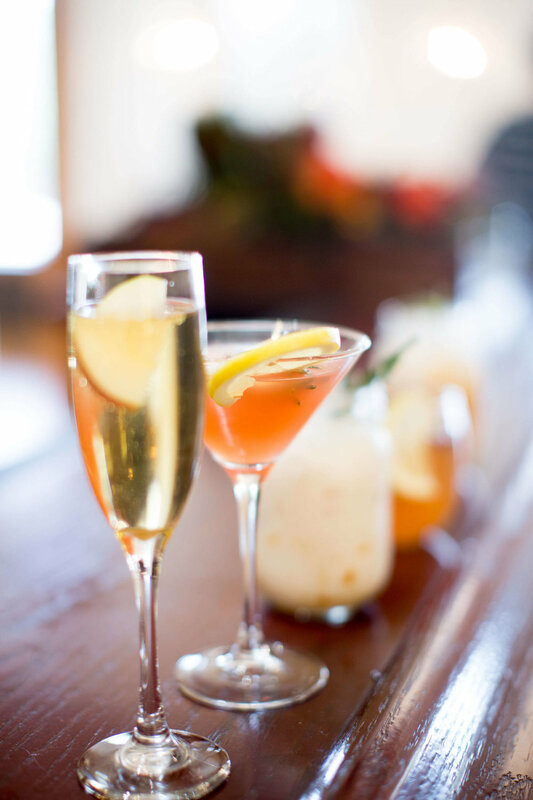 Best practice is to have said drinks pre-mixed and ready to pour, however, if you want them available upon request make sure that you have an additional bartender (or even a separate bar) to keep the rest of the line moving. Read on for a few unique but simple signature cocktails you must have at your wedding (click the image to download the recipe, because your bartender is going to want a copy of that fo’ sho’). Forget I ever poo-pooed peach schnapps and try out this spritzer. Perfect for spring/summer weddings, but swap out that lemon for a rosemary sprig and you’ve got yourself a dainty fall/winter drink. Great as an after dinner dessert drink or just an awesome addition to your hot cocoa bar. Sophisticated but unique. Your selecting this cocktail because you want your guests to feel uber fancy. Talk about a crowd pleaser. Perfect for those Minnesota fall weddings at the orchard or at a barn venue. Pairs well with freshly picked Honeycrisp apple place cards (think an apple set on the napkin with a toothpick donning each guests name). Have any other drink suggestions? I’d love to add them to the list, comment below with a link to the recipe!